Archos' Android phone pics break cover? 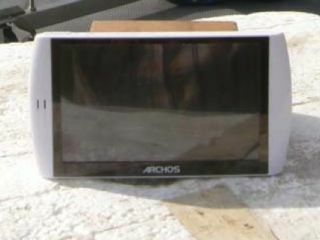 A new Archos device, likely the new five inch Android handset, has been snapped by the FCC over in the US. It has a similar design to the Archos 5 Internet Media Tablet, as we told you last month, but has more features befitting a mobile phone. However, this isn't really a phone, and more an Android-enabled media tablet, and will be the first widespread device of this genre when it's announced on 15 September. The photos show it to have a slightly more rounded frame, a re-located headphone jack, a microUSB slot and what looks like a port for a microSD card too. Given Archos is rumoured to be packing up to 500GB of storage on there too, this would mean hot swapping is also important to the French PMP manufacturers. Pictures from the FCC also show the unit running a very un-Android-like interface, which is likely to be Archos' own OS running alongside Android, as UK MD Tony Limrick told TechRadar exclusively. Either way, roll on 15 September - we can't wait to have a proper look at this one.